Note: Updated at 4:06 am EDT on 8/31/2008 to provide post script. I chose this clip over the official video because Frida and Agnetha are much more appealing in short hemlines than winter coats. Well, that and the Japanese seem to have an amazing knack for choosing the most inappropriate stage setting for a song about a collapsed relationship. It's shortly before 10 pm on a Saturday night. Kids have been in bed for about half an hour, and I've just flipped on the stereo in anticipation of the local adult alternative station's weekly two hour block of jam bands, funk, reggae, and other stuff. It's nice to be able to turn on the stereo in the main family room. I've got a couple bottles of Australian Riesling in the fridge, and I'll probably be popping one of them open here in a bit. It's time to catch up on things. Yeah, I'd be lying if I denied that visualizing the house in post-separation disorder, soundtracked to the song "Knowing Me Knowing You", more than once in the lead up to the past month. My wife got the keys to the apartment a little more than four weeks ago and began a slow process of moving things out. The next weekend, I helped her move quite a bit of large items to the apartment. By the 10th, she had enough items moved in that she and the girls started staying the night there, and not a moment too soon. Our older daughter started kindergarten on the 11th. I wound up coming over to the new apartment once to fix the wireless router I had set up at her place so that she could continue to work from home. That first week with them all out of the house was draining. I enjoyed the silence, but the sheer disarray and emptiness of the house left me with no desire other than to work. Ironically enough, my ability to work longer hours in the office have been constrained by the departure because I have custody of the dog, so he can't stay cooped up too long. By the end of the first week, I managed to get the house picked up some. My motivation was to have the place tidied up enough for the girls because I would have them for the first weekend. My first weekend with the girls was nice. We went to the coffee shop and played board games. Went to the mall to get some accessories for their stuffed-animal-in-a-box and play at the indoor playground. Sunday was a bit lazier, but they seemed content. I brought them back to my wife's apartment around 7 pm Sunday, fed and bathed. True to Murphy's law, the older daughter got nauseous and threw up after I left. I got a call from my wife asking me to get a digital thermometer because she was worried about the daughter's temperature and her thermometer was registering bogus values. I made a stop by the drug store between here and there and dropped it off. When I got to the apartment, my wife was in tears. It turned out that our daughter had thrown up on my wife's new bed spread and it got destroyed by the washing machine. She had paid over $100 for the set on clearance at Macy's. I did some searching on the web later that night and pointed her to an eBay merchant who was selling the set for $30, so she was able to replace the damaged goods without too much loss. Adding to my wife's anxiety that weekend was news that her employer had hired a new director of operations who wished to interview all employees under him so that he could get a better idea of their roles. Her read on this was that her job might be imperiled. I tried to calm her down, encouraging her to get in touch with some of on-site employees whom she had known for a very long time to see what was really going on. I also recommended that she spend some time drawing up the case that her work adds real value to the company. The interview came and went last week, and to the best of my knowledge she has not received any indication that her job is in danger of elimination, so that storm cloud may have passed by. The relationship between my wife and me has been mostly civil, but it has taken on an edgier tone the last week or so. I think part of it is the reality of single parenthood is starting to sink in with her, so it's probably draining her. Second, I've started to push back some on some of her requests for me to take time off and watch the kids. Prior to her moving out, we sketched up an agreement that would have us alternate weekends to watch the kids. I would pick the kids up at 6:30 on Tuesdays from dance class once it started, and on weeks where I didn't have the kids that coming weekend, I would come by and get the girls for a few hours to spend time with them. Then after she moved out, we spent some time drawing up the calendar for more concrete plans. I took the kids the first weekend because I wanted to give her the break to recover. She also asked me to take them from around 10 am on Saturday through 5 pm Sunday so that she could go down to one of the state's casinos with her best friend. She listed some days that she needed me to take off work early. One was for a meet-the-teacher meeting at the older daughter's kindergarten. Two were because she needed to do some work at a preschool co-op open house (21st) and orientation (28th). The other was a biggie. To help pay for our daughter's participation on the dance school's competition team, she was going to work at a concession stand at the Big Oil Branded Brick Stadium, where our overpriced football team plays, on behalf of the dance school. The game started at 7 pm on the 28th, and she was planning on heading out at 1 pm with no idea of when she would be back. I committed to all of these things, plus watching having the girls one day out of the Labor Day weekend, going with her and the girls to the amusement park in the southwestern part of the Buckeye State. So the girls were definitely not deprived of me. On the day of the orientation, she asked me if I'd be willing to take a half day off in a few weeks so that she could chaperone for a field trip. Then on the night of the football game, she said she would need me to watch the girls the better part of Sunday afternoon and evening because she had to work another football game, suggesting that I take the kids that weekend, too. I refused to commit to the half-day off for the field trip until I could get some reassurance that the requests for taking off would not become a frequent activity. She said fine and then said that she just wouldn't do it. Then when I raised concerns about me taking the girls for another weekend, she got irritated with me and said that she'd talk with me about the schedule on Friday so that I could have it all planned out and wouldn't interfere with my life. It was a guilt trip move I had seen before, and I didn't buy into it. We did get the weekends mapped out on Friday, she was still in a snippy frame of mind, but I did get my first kid-free weekend this coming weekend. I also managed to negotiate a kid-free weekend so that I can join up with some other bloggers for a gathering in a little less than two months from now. As for finances, it's been good to get some separation of accounts. She has her own checking account now, and she doesn't touch the joint one. Now that I have greater control of the checkbook, I feel a lot more secure. Two child support payments have been made. The first I wrote a check for, and this past one was direct deposited into her account so she doesn't have to fuss with cashing a check at the bank. I'm paying an amount that is just north of the state guidelines, so it should pass muster with the courts once we start the divorce proceedings. I wound up drawing down on some savings to pay off all non-mortgage debts except for the card where she ran up the balance and another revolving credit card for a major department store. I said she could take over that one since it's fairly small balance. I am taking over that account and transferring it to a vehicle that has a much lower interest rate. My goal is to vanquish that debt within a year or two. I started cleaning up the huge stack of mail on the kitchen table and catching up the bills this weekend, and everything is in order now. I finally followed through with something I had pressed for a couple years go to help save money but my wife refused to compromise... I downgraded my cable service to a minimal family tier package, getting rid of a DVR converter box. That should slash my cable bill by more than half. Sometime this week, we will be splitting cell phone plans. She is going to get her phone migrated from our account to the one held by the preschool mom friend. This weekend, we signed the paperwork that resolves the legal status of the embryos we've had in cryopreservation since late spring 2004. Work has been a bit more harrowing than it has been in the past. I'm sure part of it is the stress of the separation, but it also didn't help that my boss got the idea of completely redoing an administrative webpage for our application, which required rewriting a massive amount of really ugly legacy code. As we neared the latter phase of the project, by his own admission it had turned out to be a much more complicated project than he imagined. I'm hoping that my added efforts win me high marks on my next evaluation, which should be coming up in the next month. Some other things going on at work... Our department hired on another system engineer, allowing us to expand into an adjacent room which was being used for a conference room. I like the new room better, with its well lit space and a better view of the city. A few weeks back, our department took its first field trip... the State Fair, where we had endless amusement people watching, animal watching, and eating greasy food. We have a weekend outing that was supposed to happen in mid-September... a curling class. That might get pushed out to the next month, which could be a stretch because it is supposed to be happening the same weekend that the blogger gathering is supposed to take place. Since the class and practice is only a couple hours, I don't think it will be too much of an issue. OK. That was a lot more work than I had envisioned. Those of you who have endured separation or divorce, especially if you were on the starting-all-over end of the equation, probably have had this happen at one time. You start to do something and realize that you're missing a tool, vessel, or utensil needed to do a task, and then realize you don't have it. I searched the kitchen drawer for a corkscrew or similar cork removal device and found that I have none. I know we had at least two such devices at one time, and now we have none. My guess is that either my wife took it with her, which is questionable because she hates wine, or she loaned it to her best friend, who does drink wine. What seemed to get me the most traction was a paint can opener. It had the requisite length, hook, and strength. 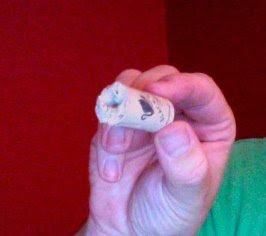 I'm adding a corkscrew to my list of things to get at the local cheap stuff store. I've included a picture of the aftermath for your amusement. The track is "Roll Your Own" by Tripswitch. Good stuff. I'm also working up the nerve to finally tell friends about the news of my marital collapse. I took a baby step a week ago and changed my marital status on my Yahoo profiles to "separated". Today, I finally took advantage of one of those classmates.com membership promotion discounts and got the gold membership. I updated my long dormant profile and change the marital status to "separated/divorced". I'm going to reach out to a couple of old school friends who live in the area, too. As for socializing, I'll be heading up to the the near northeast side on Wednesday night to go to a local PenguinOS user group meeting where a system engineer at my employer will be giving a talk about our web application. I think a bunch of us are going out for adult beverages afterwards. That should help me get in better touch with members of my "tribe" as Drunken Housewife would call it. On Monday, I've made commitments to pay my mom a visit. She and one of her friends at the apartment complex are grilling brats. It will be the first time that I will have seen her since news of the breakup was released. I'm not looking forward to it, but it's part of the process of confronting my anxiety. With fall setting in, I'm starting to eye the entertainment papers to see what's going on where. I need to find me a regular activity that is non-technical to take my mind off of work. The workaholic path has helped me pass the time waiting for the separation, but now it is time to branch out and build the social network. With each change, these ashes show signs of life. That's the update from here. If you've got any other questions feel free to pose them in the comments. UPDATE: It's shortly after 4 a.m. I fell asleep about two hours ago, after having finished off the bottle of wine. The sad part is that I was IMing with someone. I've never fallen asleep on a conversation. So embarrassing! The ironic thing is that I woke up to "Closer to Fine" by the Indigo Girls, which includes a verse about getting drunk at a bar 3 a.m.